The Manchester City and Ivory Coast midfielder lost out to Borussia Dortmund's Pierre-Emerick Aubameyang in the voting, a decision he says "brings shame to Africa" Manchester City midfielder Yaya Toure has reacted angrily to losing out on the CAF African Footballer of the Year award, saying the decision is "pathetic", "indecent" and "brings shame to Africa". 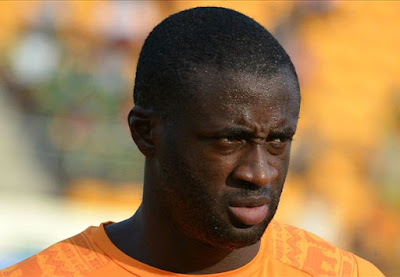 Toure hit out at his critics in a controversial interview in October, accusing detractors of "spreading bulls***", and has had a number of run-ins with the press in the United Kingdom and his home continent. The 32-year-old captained the Ivory Coast to their first Africa Cup of Nations triumph since 1992 at the start of last year and was named in the competition's team of the tournament. But he lost out to Borussia Dortmund striker Pierre-Emerick Aubameyang in the individual stakes - voted for by coaches and technical directors - and has now hit out at the decision makers, insisting "even Fifa" would not have reached such a conclusion. “I’m very, very disappointed," he told Afrique Foot. "It’s sad to see Africa react this way, that they don't think African achievements are important. “I think this is what brings shame to Africa, because to act in that way is indecent. But what can we do about it? Us Africans, we don’t show that Africa is important in our eyes. We favour more what’s abroad than our own continent. That is pathetic. Toure is no stranger to courting controversy in the press and it appears more on the way after he vowed to "tell the truth" when questions come his way. “Yaya will take care of Yaya and let Africa take care of itself," he added. "As I’ve been told many times, you can’t take care of Africa too much because Africa will be the first to let you down. “When I return to Europe, a lot of questions will be asked. I think I’m going to have to answer them.